We’re continuing our story of haying in the 1940s and 1950s on the Scheckel farm outside Seneca in the middle of Crawford County, Wisconsin. On an early June morning, with dew still on the grass, my brother Bob goes out to the fields where the cows grazed overnight. That’s the same field that Dolly, the bigger black horse, and the reddish Prince, will be grazing. Slowly approaching with a sugar cube or a small apple in his outstretched hand, Bob has the halter slung over his shoulder. The halter has a nose band and a head strap that buckles around the horse’s head. A six foot long quarter inch rope attaches to the halter. The halter allows the horse to be tied or led. Dolly and Prince advance slowly or stand their ground. They know the routine. You can imagine what they’re thinking, “I get my sugar cube, but I got to work all day”. The halter slides over the horse’s head, buckled, and with attached rope, the horses are headed to the barn for harnessing. Harnessing horses is an art form, and Dad was good at it. Horse harnesses were stored on pegs behind the horses and against the wall of the horse barn. The horse barn was an alcove inside the Big Barn. First the collar was placed over the horse’s neck. Two horns, or hames, stuck out the top of the collar. Coiled up reins could be hung on these hames. I didn’t know that when I was a little tyke. 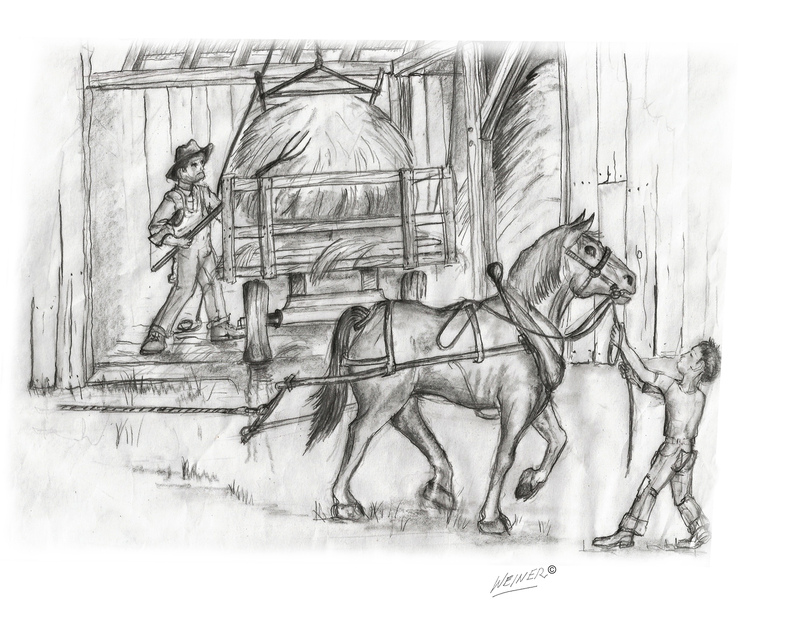 For me, those hames were places to hang onto when Dad lifted us kids up and sat us down on the horse to ride out to the field or to ride home from field to house for noon dinner or the end of the work day. The bridle would go on next. The halter has no bit and bridles used a bit in the horse’s mouth. The sides of a horse’s mouth is very sensitive, so pulling on the reins pulls on the bit, which pulls the horse’s head from side to side. This is how the horse is controlled. The reins connected to either side of the bit. This is how the horse is “steered”. The farmer drove the horses with the reins. The reins were black leather straps that extended from the bridle back to the driver. There were supporting rings to carry the reins over the horse’s back, so they won’t get tangled. When two horses were used as a team to do farm work, which was most often the case, the outside rein from each horse went back to the driver, and a short bridging strap or rope connected to the inside of the bits. In this way, the farmer drove two horses with only two reins. The collar was everything. Made of leather and stuffed with straw, the collar fit over the horse’s head. All the weight that is pulled is applied to the collar. A good fitting collar was important. If the fit is bad, the horse developed sores.